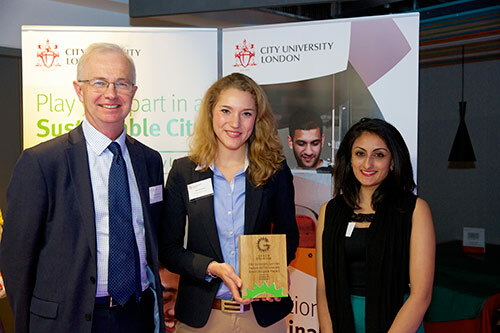 The efforts of staff and students to make City a greenerUniversity have been celebrated at the City Sustainability Awards. During the ceremony held at CityBar on Monday 8th June, 28 awards were handed out to reward participation in the Green Impact and Green Dragons initiatives. Green Impact is a scheme run by the National Union of Students to encourage Universities to become more environmentally friendly. This year, 22 teams took part in the initiative, helping to improve anything from recycling levels to energy usage. and Lucyna Tomaka who received Platinum accreditation. The awards also recognised the teams taking part in the Green Dragons scheme. Green Dragons, an initiative run by the Students’ Union, City Enterprise and the Environment team, supports students to run their own sustainability projects. As part of the programme, students and staff who enter can receive training and advice from experts across the University, along with funding to support their project. Previous projects have included Meat Free Mondays, and Get Your Green On, a project to reduce the use of plastic water bottles on campus. This has been a hugely successful year for student and staff engagement in sustainability initiatives.